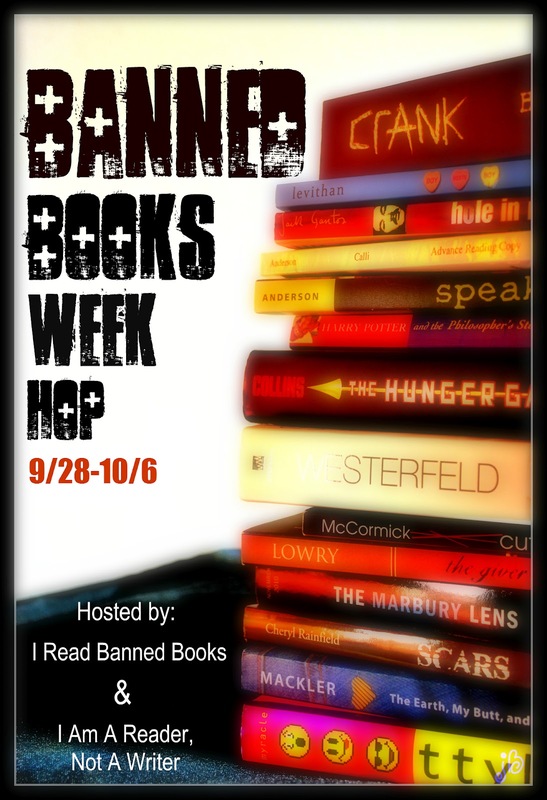 Announcing the 2nd Annual Banned Books Week Giveaway Hop! I am co-hosting with I Am A Reader, Not a Writer again this year. I think my blog title says just a little bit about how I feel about the freedom to read, but in case it wasn't quite clear...I Read Banned Books. And, I support others that do as well! Banned Books Week is a week to celebrate Intellectual Freedom, Don't get hung up on the term "banned," we haven't actually banned a book in years, but we do challenge a book for removal. No bueno. Required: give away a challenged book or include information about Banned Book Week as part of your giveaway post. The dates for the hop are September 28th to October 6th. 1. 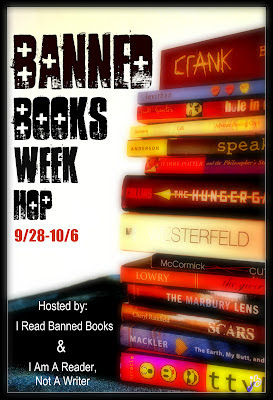 The Banned Books Week Giveaway Hop image needs to be part of your post. 2. Include the linky list with all the participating blogs at the end of your post OR link to this blog post. 3. You giveaway must be related to Banned Book Week - You can giveaway a book that has been banned or challenged or if you are giving away a gift card you must post some information about Banned Books Week. 4. Keep It Simple! One (1) mandatory entry and no more than five (5) optional extra entries. All entries must be able to be done on one visit to your blog - Entries such as tweet once a day are NOT allowed (tweeting once is fine).You must turn off word verification/CAPTCHA if you are requiring more than one comment for entries - If you are concerned about spam then enable comment moderation. If you are using Rafflecopter you can only have six (6) possible entries per person. 5. This must be a giveaway specifically for this hop and must run only the nine days this hop is scheduled. 6. Keep your giveaway easy to find for the entire nine days this hop is open. 7. Your blog needs to be "family friendly". To sign up to host a banned books week giveaway just add your blog or website to the linky below. Please include your shipping information after your blog name.